First, a rant: Dell is really taking advantage of the media with the new Adamo XPS notebook. It’s classic. First they put up a teaser website a month ago that shows nothing but the incredibly thin dimensions and a side picture. Then they call a press conference where all they do is wave around the notebook for 3.5 seconds and then put it away. Now, there is a press release that contains nothing but two new pictures. This practice is tiresome and I hate that we must play the game, Dell. Anyway… on to the press release. 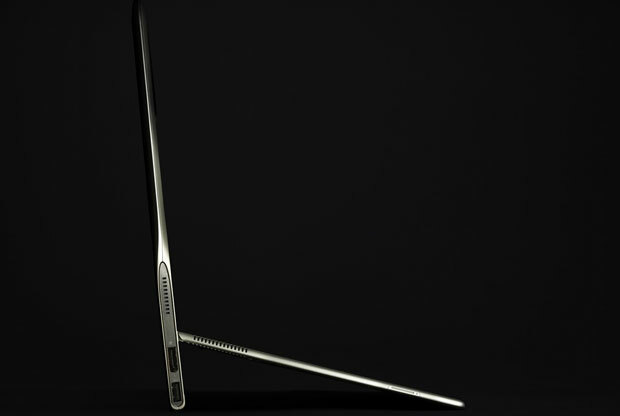 The new pictures shows off the unique hinge design of the Adamo XPS. It’s exactly how I thought it would work after seeing some pictures from the 9/9/09 event. The notebook is so small that designers had to pack all the computing hardware under the screen instead of around/under the keyboard. The result is what we see above as the hinge had to be moved up so the screen to keyboard ratio isn’t thrown off. I’m just curious how the notebook will stay open when sitting on your lap. Oh, and I of course wanna know the price and specs too.